Lenovo announced late last week that they will soon offer a 9.7 inch tablet running Android 4.0 (Ice Cream Sandwich). A video released by Lenovo previewing the new tablet is below. The tablet will be called the Lenovo IdeaTab S2109. It has a thin form factor, coming in at just 8.9mm (about a third of an inch) thick. The tablet will have a 1024-by-768 screen resolution, a camera designed for video chat (1.3 megapixel), but won’t have a rear camera. The tablet will also have a microUSB slot, a microSD memory slot, and a micro-HDMI jack. There will be four speakers on the back. Other than that, Lenovo hasn’t released many details. So we don’t know about its processing capacity, storage, and memory. No release date or pricing information has been provided yet either. 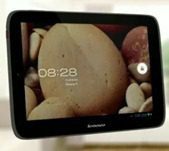 Speculation online is that Lenovo is positioning the IdeaTab S2109 to compete against Apple’s iPad 2, and that it will be priced the same or slightly less than the iPad 2, from $300 to $350.